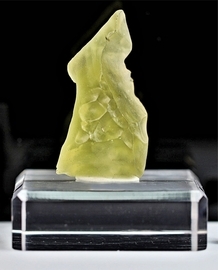 Authentic Libyan Desert Glass Pendants Necklaces Jewelry Libyan Desert glass is the ejected, melted and then cooled coalesced sand droplets that are the results of an asteroid, comet, or meteorite space rock impacting the Libyan Desert 26 million years ago. From that event the heavens rained backed to earth these all-natural shimmering droplets, only found in the Libyan Desert, and are the solitary remains that speak of a vanished era long ago when a space invader pummeled the now Libyan Desert. Each beautiful and unique pendant necklace jewelry setting is a historical reminder of the heated, tortured sand that was formed, and the resulting droplets are now considered to be exotic, space jewelry gemstones. 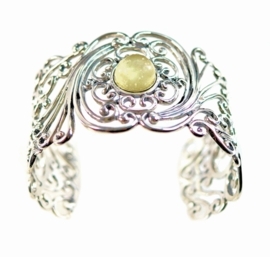 We have fashioned these beautiful, froth-like yellow gemstone droplets, discovered and gathered by explorers to the region, into fine cosmic jewelry. Archaeologically, it was so valued by the ancient Egyptians to be the centerpiece gem on the breastplate of King Tut! This authentic Libyan Desert Glass was legally collected and elegantly woven by a skilled artisan into this sterling silver, 14k gold and stainless steel exclusive jewelry.